Our goal at Massachusetts Bay Trading Company is to bring you all the best that the Commonwealth has to offer. We have collected the finest and guarantee the quality. All products are delivered promptly to almost anywhere in the world. We hope you will have the chance to visit our state and experience a taste of the American Revolution and take a walk along Boston's Freedom Trail. But, whether or not Massachusetts is in your travel plans, you can always come to our site for the most convenient, quality source of Pure Yankee Ingenuity. 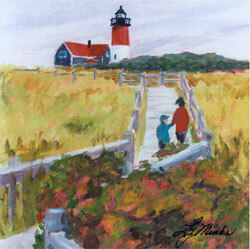 Nauset Lighthouse, Cape Cod National Seashore, by Massachusetts artist Louise Minks. service and that is what we provide. We invite your comments and suggestions. Please let us hear from you!